You change your Facebook password. Facebook blocks our access based on some internal undisclosed logic. In the event this access is invalidated we send you an email straight away and we notify you of the temporary problem. You should not worry about your reviews as we save a temporary copy of them and so your reviews will still be showing. 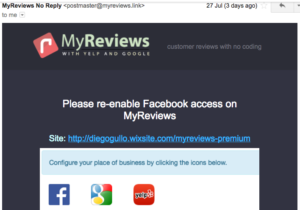 However we ask you in the email to go back to your editor and reset your Facebook configuration so MyReviews can get a new access authorisation for your reviews. We know this is not ideal but Facebook does not plan to change this and make it more stable. A good aspect of this is improved security against your Facebook data.